How do you save yourself when you're already dead? 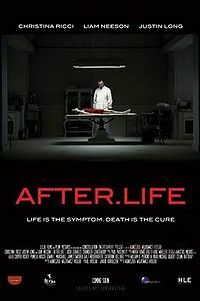 After.Life (2009) is a psychological horror movie about a young woman caught between life and death. Anna Taylor (Christina Ricci) wakes up in a local funeral home and finds herself on a slab while the home's undertaker, Eliot Deacon (Liam Neeson) tells her that she's dead. Panicked, Anna doesn't believe she's dead. Despite her denial and pleas, Eliot calmly and chillingly convinces Anna that she's dead and he has the gift to speak to the dead to help them with their transition to the afterlife. His job is to make sure she's able to cope with her own death prior to her funeral. Confused and lonely, Anna is forced to believe what Eliot has told her. This movie has an interesting plot. It gets darker and darker as it progresses and you might start to doubt what you believe in the first place. Is Anna really dead? Why is Eliot behaving so evasive and weird? This is the strength of the movie - surprisingly provocative and unusually chilling. About the actors, Liam Neeson gives one of his best spine-chilling performance. His calmness is eerie. The petite Christina Ricci is practically naked or if she's covered, she's either dressed in a vibrant red slip or covered by a white sheet on the slab throughout the entire movie. Justin Long is so-so as a grief-stricken guy who sheds tears ever so easily. Well, overall, if you're a horror fan, you might enjoy watching this less intense yet thoughtful and eerie movie.